Whispers in the Loggia: At "The Heart of Our Nation and Church," The President Talks "The Law of the Gift"
At "The Heart of Our Nation and Church," The President Talks "The Law of the Gift"
Returning to the alma mater where he earned his doctorate in the history of the American church under the venerable John Tracy Ellis, this Saturday saw the Cardinal-President give the Commencement Address at the Catholic University of America as the institute chartered by the US bishops with the approval of Pope Leo XIII closes out its 125th anniversary. 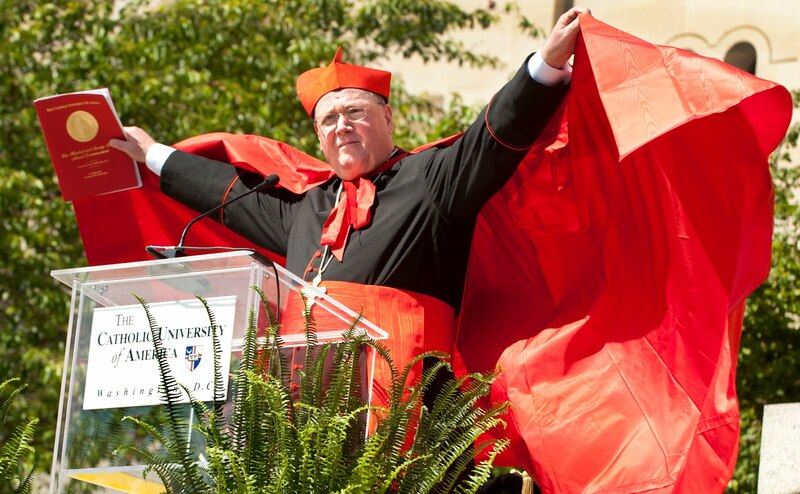 Alongside the speech on the East Steps of the Basilica of the National Shrine of the Immaculate Conception, Cardinal Timothy Dolan received the university's President's Medal, CUA's highest award, given for "extraordinary service to the church, nation and" Catholic U. In its milestone year, the university graduated some 1,500 students at today's ceremonies.